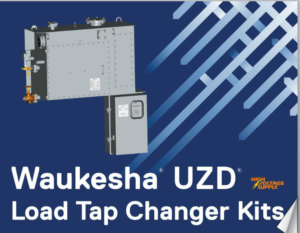 Since its introduction, the Waukesha® UZD® has developed a track record as a trusted and reliable high speed resistance bridging load tap changer (LTC). Today there are more than 6,500 units in service. Over the years, several design modifications have been introduced that have enhanced operation and improved reliability of the Waukesha® UZD® LTC. This Tech Tip will highlight the most significant design upgrades and enhancements that have been made over the years. Detailed information on the purpose and impact of each will be illuminated. We will also provide access to other key technical resources that you can use to better understand the operation and maintenance needs of your Waukesha® UZD® LTC. The UZD is a three-phase, fully insulated, externally mounted load tap changer designed to be applied to liquid-filled power transformers. It is a 33-position switch designed for plus/minus operation by use of a reversing change-over selector switch. The UZD is rated to carry a maximum through current of 600 amps at a nominal system operating voltage of 34.5 kV. The main tank of the UZD LTC is comprised of two compartments. The first is an oil-filled switching compartment with a 100 gallon oil capacity. This oil-filled compartment houses the tap selector and the reversing change-over selector switch. The second compartment of the main tank is air-filled and is home to the spring drive mechanism. 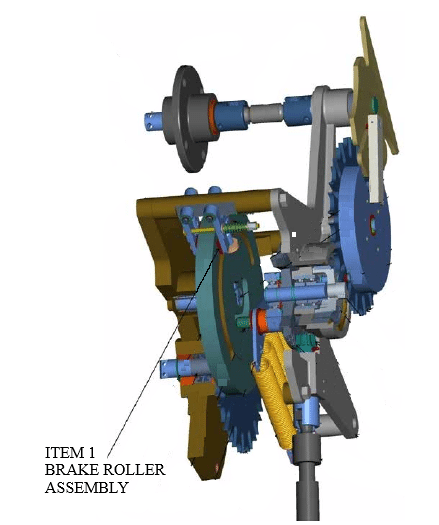 The spring drive mechanism is connected via driveshaft to the motor drive mechanism which is located in a separate ancillary enclosure called a BUE. The BUE provides mechanical power to the spring drive mechanism and houses electrical control, signaling and protection equipment. Figure 1 below depicts the configuration of the two compartments of the main tank and the BUE enclosure. In the following sections, the modifications that will be addressed have been grouped together in subsections based upon their physical location. The subsections represented below are the switching compartment, spring drive compartment and BUE motor drive enclosure. This grouping aids in pinpointing the physical location of each modification and can be utilized for top level planning of inspection and maintenance activities. The vast majority of modifications developed over the years are applicable to components that are located in the switching compartment. 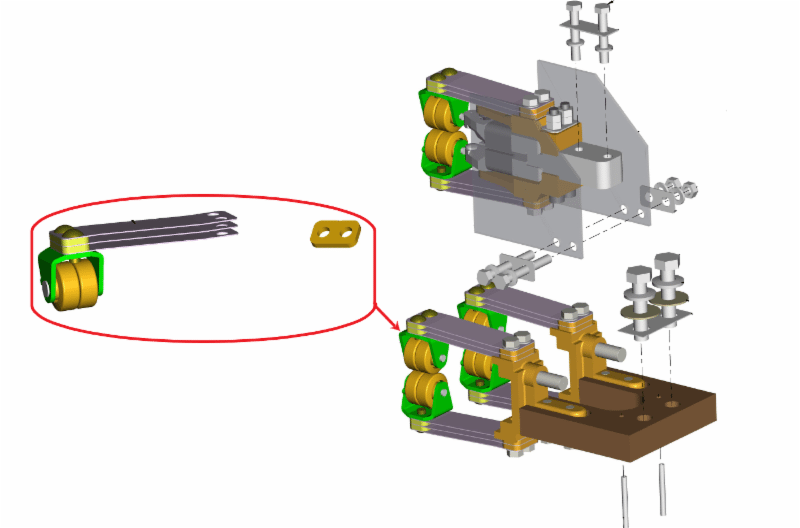 Figure 2 below is a graphic depiction of one of the three identical cast epoxy phase moldings with assembled contacts located in the switching compartment. 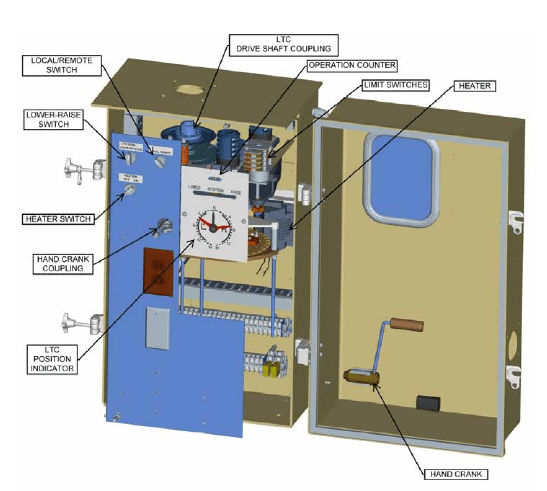 Each of the sub-assemblies in which modifications have been developed are identified below by call out arrows with labeled item numbers. Item 1 in Figure 2 above is the moving selector switch assembly. 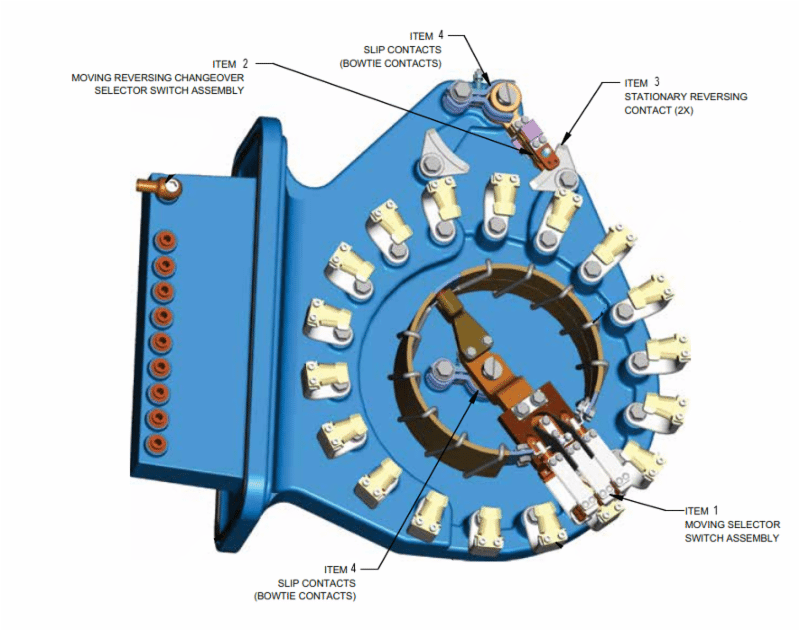 Figure 3 below shows a detailed view of the moving selector switch assembly and an individual view of a contact roller sub-assembly. Our first example of components that have been modified are circled in red above. In order to increase contact pressures, the leaf spring count of each of the sub-assemblies was increased from two to three. Additionally, the design of the pins that secure the rollers was changed from hollow to solid to increase rigidity and reliability. An edge radius was also added to the rollers to reduce wear and a nib was added to the collar to improve alignment in the sub-assembly. These modifications are offered as part of a kit under part number 1030-027K-OEM. Figure 4 below is an enlarged view of the area of the phase molding that includes the complete reversing change-over selector switch assembly. Figure 5 below is an exploded view of Items 1 and 2 depicted in Figure 4 above. 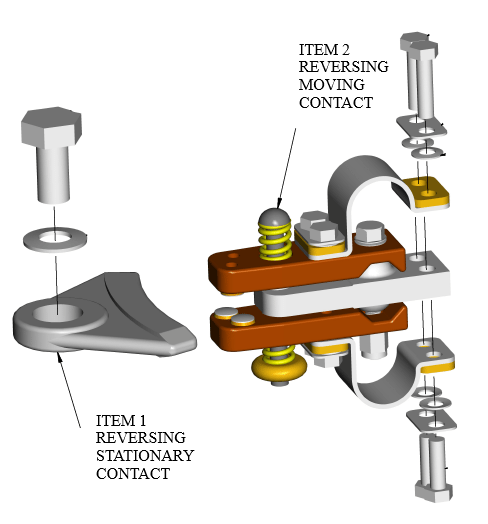 Item 1 is the reversing stationary contact which has seen two modifications to enhance performance. First, the mounting hole was offset to improve alignment between the moving and fixed contact. This change was made in 1991. In 1994, the finish of the contact surface was changed to a 32 micro-inch polish. If your unit is older, you might want to consider changing the reversing stationary contact to the new style which includes both enhancements. The associated part number is 1030-384P. Item 2 is the reversing moving contact sub-assembly. In 1997, several design changes were incorporated into this sub-assembly to improve performance. The number of contact points and the spring pressures were increased. The springs were moved outside of the current path. A self-aligning feature was built into the main current path and a backup shunt was added. Item 2 is available under part number 1030-371P. Figure 6 below is an exploded view of the main slip contact sub-assembly. This sub-assembly is applied in both the selector and reversing switches. 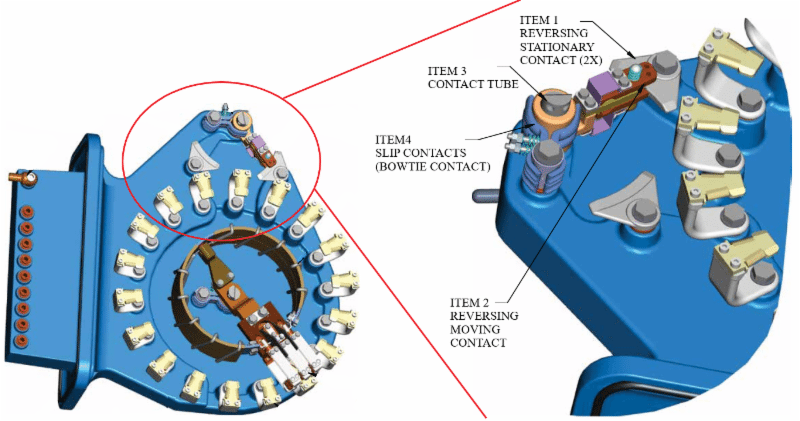 The location of the slip contact sub-assemblies in the fully assembled phase molding are indicated by the circled areas in the figure on the left. The contact tube labeled below as Item 3 has been improved by changing to a machined copper material with thicker tube wall and an integrated shoulder. The original design utilized a steel washer. The changes improved reliability of the sub-assembly and reduced the operating current density. The applicable part number for the improved contact tube is 1030-065P. Item 4 below depicts the slip contacts. In 1992, the design was modified to increase contact surface area. The revised design is available under part number 1030-025K. Rounding out the upgrades available for the switching compartment are those that were initially introduced to enhance unit reliability by improving oil quality. In 1988, the original flat door gasket, part number 2011486, was replaced with an “O” ring gasket to achieve better sealing and longer service life. The “O” ring gasket is carried under part number 2007012. For units produced before mid-year 1995, there is a universal entrance tube kit available. This kit allows the customer to add a UZD oil filter without having to drill holes and weld joints in the field. The part number for this kit is 1030-014K. Finally, the 2nd generation auto-recharging dehydrating breather (ARDB2) is recommended. When properly installed, the ARDB2, part number ARDB2-0000, keeps the LTC oil dry and does not require maintenance personnel to periodically change-out the silica gel. The spring drive compartment is situated adjacent to the selector compartment and is not oil filled. The spring drive allows the tap changer to be operated manually while energized and carrying load. 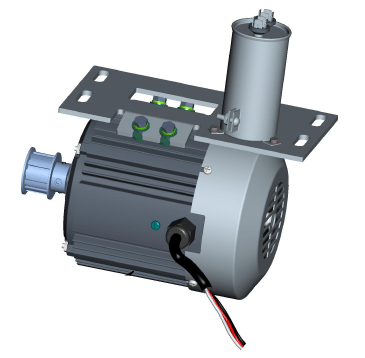 Once charged and activated the stored energy in the spring drive mechanism results in high speed operation and minimum arcing time. The design of the spring drive mechanism ensures that each tap change is consistent and unaffected by voltage interruptions or manual hand cranking speed. Figure 7 below depicts the fully assembled spring drive mechanism as it is mounted in the spring drive compartment. A magnified view of Item 1 in Figure 7 at right is presented in Figure 8 below. 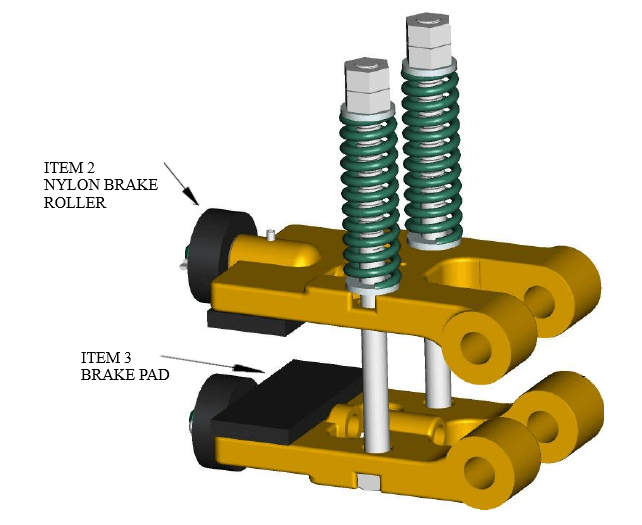 There have been two enhancements made to the brake roller assembly of the UZD. The first is listed as Item 2 below. The nylon brake roller was changed from the original nylon material which was white in color to a new nylon material that is black in color. A lubricated bronze insert was also added to the new black nylon roller to improve wear characteristics. The brake rollers can be purchased individually under part number 1030-043K or they also come installed as part of the full assembly as depicted in Figure 8 below, available under part number 1030-042K. Item 3 in Figure 8 are the brake pads. Originally, the brake pads were secured to the shoes via rivets. In the new design, the pads are glued to the shoe to improve resistance to corrosion in the connected area. 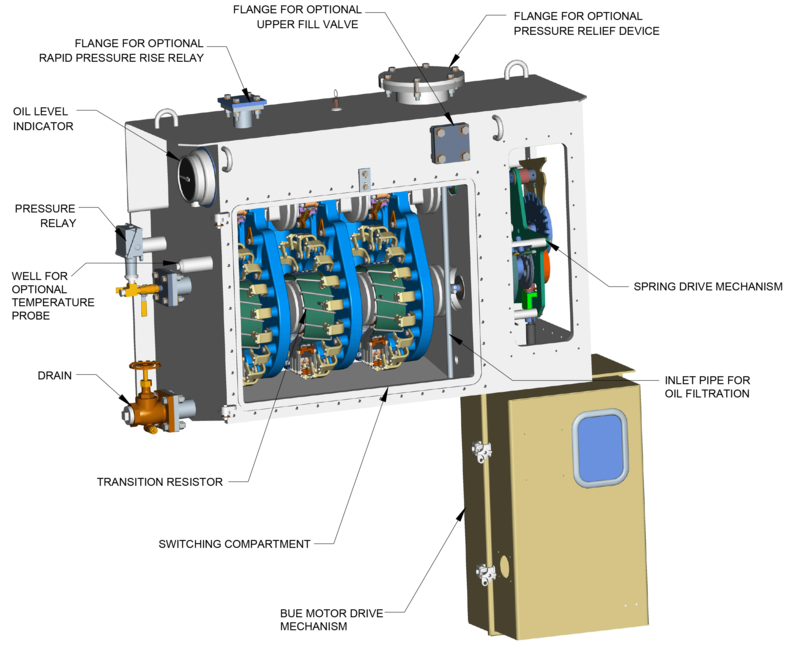 The BUE motor drive enclosure shown in Figure 9 below includes the drive motor that charges the spring battery in the spring drive compartment which operates the LTC. The BUE motor drive enclosure is located at a convenient height and includes the operation counter and position indicator for the LTC. The BUE motor drive enclosure is readily accessible at ground level for inspections and maintenance. 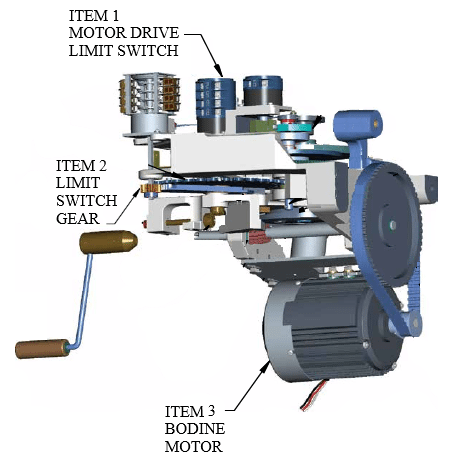 Figure 10 below is a graphic of the a BUE motor drive without the enclosure. 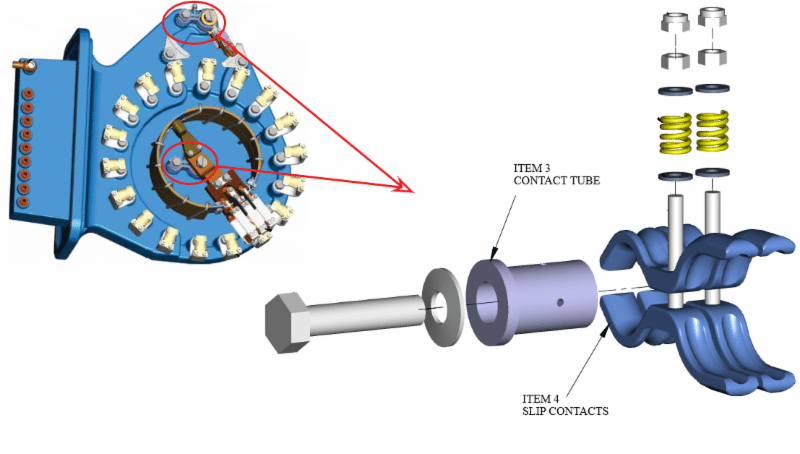 There have been three notable enhancements made to the BUE motor drive. The location of each of the enhancements has been indicated in Figure 10 below. The motor drive limit switch labeled as Item 1 above was changed in 2010. Of note is the fact that the old and new switches are not interchangeable. Item 2 above is the limit switch gear. In 2005, the gear material was changed from nylon to brass. This change was made to improve reliability of the gear assembly. The gear and associated accessories are available as a kit under part number 1030-1741K. The most significant change made to the BUE is the drive motor itself. The original ASEA drive motor was changed to a Bodine motor in 1991. At the time this change was made, the motor mount assembly was modified to accommodate the taller American Solenoid limit switches. These switches are blue in color. The drive motor and associated mounting hardware as shown in Figure 11 below are offered as a kit under part number 1030-031K. We welcome calls from customers seeking technical support on the UZD. If you need assistance, we will gladly work with you to support your needs on the UZD. To learn more about all components available from the SPX Transformer Solutions Components Group, contact a member of our sales team at 1-800-338-5526. Also, don’t forget about our library of easy-to-navigate, 3D catalogs designed to help you quickly identify and locate hard-to-find components for LTCs and oil circuit breakers. While a link is included above to the UZD catalog, the library also contains catalogs for most other major legacy LTCs and several of the SPX Transformer Solutions’ line of Transformer Health Products®.